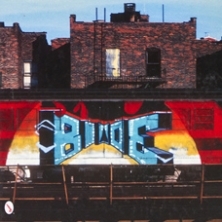 Before New York City made graffiti world famous, Blade was one of he people who made it famous in New York. He made it famous by making it look fun, and when he made it look fun, every kid in New York wanted to have fun too. Blade's letters are readable, clunky and funky. Unlike most other kids, who were copying comic strip characters, the beasties, ladies and gentlemen that heralded Blade's pieces were original to him and full of charm. His color palettes were thought out and carefully planned, even though that meant a whole lot of work to maintain a paint stash.